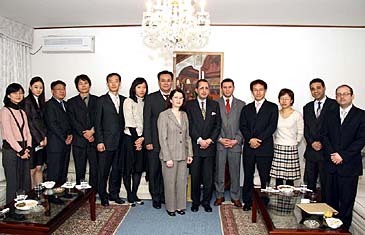 Tunisian Ambassador to Korea Moncef Baati (sixth from right)poses for camera with invited guests from Korean travel trade business community at his residence in downtown Seoul on Jan. 19, 2007. 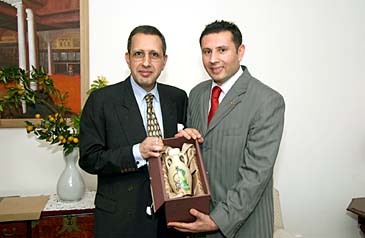 Tunisian Ambassador to Korea Moncef Baati hosted a reception at his residence in Seoul on Jan. 19, 2007 in honor of leading Korean tour operators and prominent travel writers who have recently been to Tunisia for a weeklong familiarization tour. Among them were Ahmet Sahim, director Korea of Turkish Airlines, who sponsored the fam tour with complimentary roundtrip tickets for all, Lee Sang-jin, area manager of Emirates Airline, Oh Seong-min, manager of Modetour Metwork Inc. Ms Chun Young-shin, assistant general manager(Europe & South Pacific) of KAL PAK Hanjin PAK and Lim Han-wook, director & CEO of Turkish Airlines. The fam tour was organized by "Atlantis Vogages," one of the leading Tunisian travel agents and took place from Dec.11 to 18 2006. Taking into account the fact that Korea, which scores millions of tourists visiting the world every year, Korean outbound market is certainly one of the most promising and fast growing markets in Asia. The fam tour was part of the ongoing Tunisian Embassy's action programs to promote Tunisia as a new tourist destination for Koreans in high end in particular. The Tunisian Embassy has started since 2005 a serious and comprehensive promotional plan targeting the main tourist operators in Korea going from Tour Operators to Tourist Media. After one year and a half, this undergoing action has come out with encouraging results. 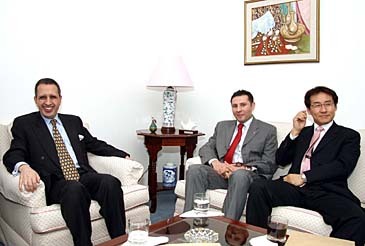 Moncef Baati, Tunisian Ambassador to Korea(left) and Ahmet Sahim, director Korea of Turkish Airlines. With more than six millions and five hundreds thousands tourists annually visiting the country, Tunisia is the first tourist destination southern of the Mediterranean. Located at the core of the Mediterranean Sea, with 1,300 km of coastline, the country offers to its visitors a great deal of diversity: a Mediterranean climate in the north, an arid tendency to the south where it becomes a Saharan type. Hence, the highly contrasted landscape: forests in the north, steppes in the center, and desert and oases in the south, according to the Tunisian envoy. "Tunisia has a diverse economy of agricultural, tourism and manufacturing sectors. I understand that more Korean tourists are visiting Tunisia nowadays although the size of Korean tourists is still far from that of European countries. Medical tourism is one of attractiveness of Tunisia," he said. There is a growing European fad for plastic surgery in Tunisia. Il could become a hub for medical tourism, he went on to say. Over the last few years, Tunisia developed other segments of tourism activities including namely:Medical tourism, which is already the principal magnet for many tourists. With 25 Thalassotherapy centers - medical treatment with seawater, today Tunisia is amongst the top world destinations for this cure, Tunisian envoy explained adding that sport tourism, with nearly twenty modern courses along the country, golf tourism is another potential niche, which attracts a wealthy clientele from all over the world. Recently a unique golf course located in the deepest desert has been inaugurated. Travelers can also enjoy several kinds of sport activities including sailing, windsurfing, water-skiing, and horseback riding. Cultural tourism, Tunisia, a crossroads of various civilizations, boasts a rich cultural heritage, as testified by its prestigious museums and cultural institutions. Eco-tourism, from north to south, many national parks and natural protectorates have become privileged observation sites to protect species reproduction and several plants, including some rare ones. Tunisian Ambassador to Korea Moncef Baati exchanges views on how to promote Tunisian tourism in combination with Dubai tourism with Ahmet Sahim, director Korea of Turkish Airlines (center) Lee Sang-jin (right), area manager of Emirates Airlines. While Tunisia is receiving millions of holidaymakers every year from all over the world, the number of Asian Tourists, scored in some thousands, still far from the large potentialities that offers the Asian Tourist market. Tourists from Asian countries are usually attracted by historical monument, sport and health facilities. Tunisia has exceptional and historical treasures, including over 20,000 archeological sites and hundreds of monuments, museums and historical centers and a total of eight world heritage sites. The most frequently visited are Carthage, Bardo Mesum (hosting the world largest mosaic collection), El Jem Coliseum and the Kairouan mosque (the first mosque built north of Africa), according to Tunisian envoy. Punic and Roman archaeological sites can be visited in Carthage and other historical areas around the country. They include a second century Roman temple on Dougga, the Phoenician port of Utica, Sbeitla's Roman temples and arches, Bulla Regia's Roman villas and El Jem's Coliseum, which is second only to Rome's. Masterpieces of Arab-Islamic architecture attract the attention of visitors. Among them are the Great Mosque of Kairouan, and the Great Mosque of Zitouna at the center of the old city (the Medina) of Tunis. Tunisia is practically among the few countries in the world, which can offer its visitors the impressive Saharian desert within easy reach. The vast Tunisian south with its lush oases and sweeping Saharan landscapes is increasingly becoming a favored shooting location for international film productions. "A promotional action is being undertaken to develop this promising market. Japanese tourist market can be mentioned as a successful example. In fact, starting to discover Tunisia, just a few years ago, as a new tourist destination, Japanese tourists visiting the country scored ten thousands in 2005," he added.